Argghh matey… there’s nothing like the leeward rail buried in the water, the tiller or wheel gripped firmly fighting the pressure, or is there? The exact right amount of heel in breeze is a hotly debated topic amongst many sailors, here is my take on it. For an efficient and comfortable ride, try to keep the heel under 20-25 degrees. Any top sailor who specializes in making a boat get from point A to point B as quickly and efficiently as possible will tell you that the real secret to speed is balance and control. In fact, even sailors who may not particularly care about making their boat go a tenth of a knot faster upwind can relate to the need for understanding sail trim and sailing technique as an aid to control. Ultimately, it is trim and technique that allow you to be the master of your boat when it gets windy (instead of the other way around). Let me offer a few simple suggestions to control helm and heel, but first, let’s look at the question of how much heel is appropriate. In quantitative terms, the answer is probably somewhere between 20 and 25 degrees maximum for a displacement monohull, depending on boat specific characteristics. 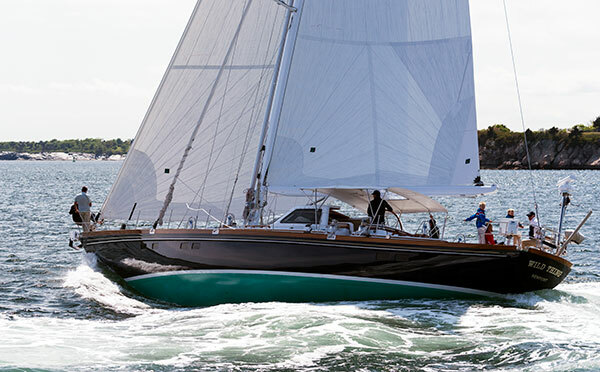 Multihulls and high performance monohulls need to be sailed at minimal heel angles. But practically, there is a simpler way to know when the boat is tipping over too far. If you have to fight the helm (a rudder angle of more than 5-7 degrees), you are heeling too far and need to adjust trim or technique. Heel equals helm. When the boat leans over, it attempts to turn itself back up into the wind, which is referred to as “weather helm.” To keep the boat going straight, we compensate with the rudder. That's fine up to a point, but the rudder is really a brake. Used too much, and it’s just like dragging a barn door through the water, which is not a particularly fast or efficient way to sail. All sailboats need an optimum of “X” amount of power. A certain amount of heel allows the boat to sail on its lines, gives the rudder bite, and helps create lift. (That’s why you will see racing crews huddled on the leeward rail in light air to induce heel.) More than “X” and the extra heel creates drag. Weather helm is the indicator. Sailing with more helm and heel than is optimal is like driving your car down the street on the doors instead of on the wheels. As in all things, we need to strike a balance and find the middle way. So, how do you stay in control? The quickest way to get a sailboat back up on its feet is to ease the sheets. This is especially true when sailing on a reach, when you are attempting to sail more or less in a straight line. Easing mainsail and headsail sheets turns sideways-force into forward-force. Ease far enough and the sail will luff, spilling excess power. When sailing on a reach, the sails can be eased in every puff (in part because of the extra horsepower, but also because the apparent wind moves aft). To keep constant rudder pressure and consistent heel, ease in the puffs and trim in the lulls when reaching. Remember, it is the sails that steer the boat. The rudder is just a fine tune device. Upwind the problem is a little more complicated. If you ease the sheets every time you get a puff, you won't be able to sail as close to the wind as you would with the sails trimmed in. You'll go fast, but won't point well. There's a powerful upwind steering technique called “feathering” that makes all the difference. Feathering means sailing by angle of heel instead of maintaining a constant angle to the wind as indicated to the headsail telltales. If steering upwind when a puff hits, let the boat head up slowly to balance the helm and maintain a constant angle of heel. Headsail telltales will lift, or “feather,” indicating a slight luff. That’s okay. You don’t need the extra power. As the puff lets off and the boat begins to get too upright, bear off slightly to maintain heel angle. The telltales will begin to stream aft in their normal upwind position. Use the telltales in the lulls, but maintain angle of heel in the puffs by letting the boat head up. If you have to ease the sheets when reaching, or do a lot of feathering to keep the boat on its feet, it is time for flatter sails. For the headsail, add halyard tension to remove horizontal wrinkles (perpendicular to the headstay). If you have a backstay adjuster, add tension to minimize headstay sag. Move the sheet lead aft to flatten the bottom sections of the sail and allow the top to twist off. For the mainsail, add halyard tension to remove horizontal wrinkles (sound familiar?). Tighten outhaul to flatten lower third of the mainsail. Add backstay to bend the mast if that is an option. Remember, you only need “X” amount of power, so it’s okay to let the sail luff a little. Upwind, drop the traveler and allow the mainsail to backwind along the forward 20-30%. Move the jib lead aft and let the top of the jib luff slightly. If you need to drop the traveler to balance the boat, the jib lead should move aft to match the shape to the mainsail. When reaching, ease the sheets and allow the sails to luff slightly rather than allowing too much heel. If you have to luff both sails constantly (more than 50% of mainsail), it’s time to reduce sail area. In general some heel is good, too much heel is bad. To paraphrase (rather badly) from an ancient Zen saying, “as in all things, the correct answer certainly lies in the middle way."